84 countries across 6 continents. 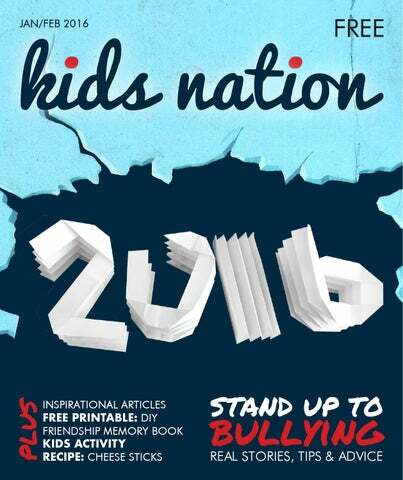 Kids Nation is a bi-monthly magazine, dedicated to empowering kids around the world. It is published by MOS Design Creative (www.mosdesign.com.au). Copyright ÂŠ Kids Nation magazine. All rights reserved. Reproducing without permission is prohibited. Copyright of articles and photos remain with the individual contributors and may not be reproduced without permission. from the editor Happy New Year to all Kids Nation readers. We hope that you had a wonderful time with your family during the holiday. Brock Griffin tells us a true story of a dad named Hector and some simple tips for dads on how to not be a bully to their kids. Don't forget to check out DIY friendship memory book printable, cheese sticks recipe, Valentine secret code message activity and inspiring handmade finds for kids! TIMOTHY h. (AUSTRALIA) for his origami craft, featured on the front cover. MIA SETYAWAN AUSTRALIA EDITOR & FOUNDER of KIDS NATION MAG kidsnationmag.com Mia is a mother of two boys and a business owner from Australia. She owns an award winning graphic design studio and print + stationery online shop. She also writes a lifestyle blog and volunteers at a local children program. ELLEN STUMBO UNITED STATES WRITER & FOUNDER OF DISABILITY MATTERS ELLENSTUMBO.COM Ellen Stumbo writes and speaks with gritty honesty and openness. Ellen’s writing has appeared on Focus on the Family, LifeWay, MomSense, Not Alone, Mamapedia and the Huffington Post. Ellen blogs at ellenstumbo.com and you can also find her on Twitter and Facebook. Brock Griffin UNITED STATES WRITING AND Publications Director oF NCF FATHERS.COM Brock Griffin helps with many writing and editing projects for the National Center for Fathering (NCF), including radio content, books, blogs, weekly e-mails, and articles for outside publications. He is also co-author of the book It’s Great Being a Dad. Desi Trisnawati INDONESIA food artist & chef consultant inspirational-chef. com Desi is the winner of Masterchef Indonesia 2012 and the first female Masterchef Indonesia. She is the author of 20 Fun Recipes of Strong Heart and creator of the Indonesia's first culinary board game Cooking with Inspirational Chef Desi. Tim Elmore united states founder & president of growing leaders growingleaders. com Tim Elmore is an international speaker and best-selling author of more than 25 books. He is founder and president of Growing Leaders, an organization equipping today's young people to become the leaders of tomorrow. tessy ojo united kingdom ceo of the princess diana award www.diana-award. org.uk Tessy is CEO of the Princess Diana Award. Prior to joining the Diana Award, she worked in the Private Sector for over 10 years. She’s a fellow of the Royal Society of Arts, has an MBA in Third Sector Management and a trustee of two charities. She is passionate about helping youngsters reach their full potential. Connect with her on Twitter. andreja vuČajnk slovenia founder of itsy bitsy fun www.itsybitsyfun. com Andreja is the creator of Itsy Bitsy Fun, a website that provides tons of free resources for kids such as educational worksheets, games, activities and craft projects. Connect with her on Facebook, Pinterest and Twitter. lizzie velasquez united states speaker, author & executive producer a brave heart film imwithlizzie.com Lizzie was born with a rare syndrome and bullied as a child and later online. Her recent documentary chronicles Lizzieâ&#x20AC;&#x2122;s journey up to her multi-million viewed TEDx talk and follows her pursuit as a motivational speaker to Capitol Hill as she lobbies for the first federal anti-bullying bill. TRAVIS PRICE canada Co Founder of Pink Shirt Day pinkday.ca Travis Price was born and raised in rural Nova Scotia, Canada. Travis continues to travel the world sharing his story about being bullied and trying to inspire others to create change. Rachel Macy Stafford united states author & founder hands free mama handsfreemama.com Rachel Macy Stafford founded www.handsfreemama.com and the NY Times bestselling author of HANDS FREE MAMA. In Rachel's new book, HANDS FREE LIFE, she describes how she started living life, instead of managing, stressing, screaming, and barely getting through life. ullying thrives when peers do nothing or indirectly encourages the situation. As a young person, you have the power to prevent or stop bullying for at least one young person, by taking action. Simple actions like extending friendship to a victim or someone who sits alone all the time, saying NO to unkind comments made as a â&#x20AC;&#x2DC;jokeâ&#x20AC;&#x2122; and encouraging positive behaviour within your peer group. These simple acts go a long way to reinforce good behaviour and promotes being an upstander, not a bystander! “thermostat vs thermometer. be a thermostat." Thermometers display the temperature of a room. They merely reflect what is going on around them. Thermostats, however, stick to a certain temperature. Their environment doesn’t affect them. In fact, they change the environment to meet their standard. ne image I use to help me remember to positively change the environment around me is the "Thermostat and Thermometer." You know what those are right? In the same way, good leaders stick to their values, and by doing so, they add value to the world around them. Positively affecting your environment starts with deciding what values you want to live by and then living them out. So how can you be a thermostat among your peers? For starters, if you see someone being picked on, speak up for the individual. Remember, real leaders are the ones who make those around them feel more valuable. ullies bully to show that they are more “powerful” than you. Some bullies will gang up to intimidate you, some try to destroy your friendships while others talk bad about you on cyberspace. There are many things that bullies can do to make you feel weak, small and useless. The important thing is to know that you are powerful yourself. Your actions can make a difference. Even though the bullying may appear big and scary, what you choose to do can stop the bullying. You can stand up for yourself, tell the bullies that what they are doing is hurtful. You can share with friends or adults and work out a plan to stop the bullying. If you see someone being bullied, you can tell the bully to stop doing or saying mean things. You can also ask for help from others around you. You are powerful. Live it, show it. A brief story of how it all started? Born with a syndrome that prevents here from gaining weight, Lizzie was first bullied as a child in school, and later online, as a teenager when she discovered a Youtube video labeling her "the world's ugliest woman." 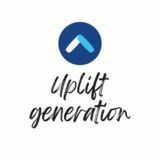 Her recent film "A Brave Heart: the Lizzie Velasquez Story" tells Lizzie's journey up to her multi-million viewed TedX Talk, and follows her pursuit from a motivational speaker to Capitol Hill as she lobbies for the first federal antibullying bill. After my TED Talk went viral I was at a time in my life where I was looking to make a change both professionally and personally. I had recently graduated college, finished my third book, and was continuing to do Motivational Speaking. In early 2014 I went to lunch with Sara Hirsh Bordo. Little did we both know after talking for a couple hours that it would be the beginning of a new chapter for the both of us. Sara asked if I would like for her to do a documentary about my life. After many conversations, we hit the ground running. Throughout the process of filming Sara opened the door to the world of becoming an anti bullying activist. She and our team were very instrumental in helping me transition from not only a Motivational Speaker but one who uses her voice for other people. A brief story of how it all started? I was bullied at school. It made me feel shy, isolated and depressed. When I joined the Sixth-form at my school to do my A-levels, the bullies had mostly all left and it was the same time that the United Kingdom created the first ever National Anti-bullying Week, 2004. I knew that my school had to mark this and so rather cheekily created a role for myself, ‘Student Anti-Bullying Co-ordinator’. Much of my work involved a team of students - bullies, bullied and bystanders acting as Anti-Bullying Ambassadors, making it cool to look out for each other and working together. It was the only way to change the culture and it worked. In 2005 I received the Diana Award and then a year later, the Diana Anti-Bullying Award. Since then I have gone on to train thousands of Anti-Bullying Ambassadors across schools in the UK/Ireland and gained the support of the likes of social media company Facebook, HRH Prince William and lots of celebrities. Today Pink Day is one of the largest anti bullying movements in the world with the Pink Shirt being the international symbol to stand up against bullying. I am so proud to be the voice for kids who feel they have lost theirs. I know firsthand what it’s like to be the bullied kid and to be silenced when you need help the most. This is why I do what I do. It’s important for kids to see people who have survived bullying to show them there is always another option. An advice for kids who experience bullying. We all have limitless potential to become something so much more. Bullies want to put themselves so deep in your mind that the image of yourself is the one they give you. That when you look in the mirror you don’t see the beauty that is YOU, but rather what they want you to be. Don’t give up, don’t quit. We are in this together no matter where in the world we are. Together we can kick, yell and scream until we are treated with respect. Together we can help stop bullying. I had the privilege of interviewing a man named Hector not long ago. His story and his insights about bullying are powerful. Chances are the word “bullying” conjures up images in our minds of a conflict in a school hallway or playground; and in today’s world it’s also happening through texting or social media. But Hector believes that bullying doesn’t start in a schoolyard, but in the home. That’s what he lived out for years. He was bullied by his father. So then, when Hector was at school, he tried to prove himself somehow on the playground. Anytime there was a conflict, he quickly became violent and disrespectful — a bully. Years later, when Hector became a father, he followed the same pattern with his kids: being aggressive, talking down to them, and so on. When he coached their sports teams, he was that way with all the kids. Eventually the pattern repeated itself again, as Hector began to see the same behavior in his own son. During a heated confrontation, Hector’s son spoke the truth in plain and forceful language. As a father, Hector’s eyes were opened to his behavior and the cycle that was being repeated. He gradually changed his ways and became a much more loving and affirming dad to his kids. Through it all, Hector also realized that his own father was never really being malicious and had not set out to be a bully. It was just the way he learned to handle things, and no one ever taught him anything different. Are there elements of bullying in the way you relate to your kids? Do you ever get in their face or overpower them physically? Do you say things that tear them down instead of building them up? Then, if you had a similar experience with your dad, Hector’s insight is powerful: your dad probably didn’t know any better; he probably never had chances to learn a different way. but we cannot continue that cycle with our children. It’s never easy, but we must find ways to slow down, think about what’s really important, and be more understanding with those kids we love so much. So, if you’re wondering what Hector learned and what he does now that is so different, here are three lessons he learned through the process that he hopes will help other dads to not be a bully to their kids. Be careful about the expectations you have for them. So often, we place a burden on our children for what they can achieve, and it’s all about what we expect of them, not what they want or hope for. It’s better to discern their goals and dreams, and then encourage them in those areas. That takes time and we need to be committed to partnering with them to help them identify their gifts and talents. Point out mostly the good things. Try to find five or six things your child did with excellence, before pointing out any mistakes he or she might have made. Say, “You were really good at this ...” Or, “I love the way you did that ...” Hector says being positive really makes a difference, and it showed when his daughter came to him and asked how she should handle a tough situation. She would have never done that before, when he was always critical of her. Commit to really understanding what your kids are thinking and feeling. They need to feel like they have a voice, and they need to trust their dad to hear and respect that voice. If you have the courage, uncover how they felt during times when you let them down or went too far. Ask questions like, “What do I do that makes you uncomfortable or disrespected?” It can be hard to hear those things, but your humility will make a big statement; they’ll see that you really are open to doing things differently. The National Center for Fathering (www.fathers.com) is a national nonprofit organization that offers innovative tools and resources that inspire and equip fathers to be more involved with their children in order to give each child a better future and to create a positive fathering legacy. Disclaimer: Photo on this article is used for illustrative purposes only and is not of the real person. She could not forget her homework, her jacket, or her lunchbox without me making a big deal about it. She could not spill, stain, break, or misplace without being made to feel like she’d made the worst mistake in the world. Although it pains me to write this, I remember sighing heavily in annoyance when she fell down and hurt herself because it threw me off my “master schedule.” My daughter was not allowed to be a child who learned by trying and yes, sometimes failing. The truth hurts, but the truth heals … and brings me closer to the person and parent I want to be. I told myself I was building her up. But in reality, I was tearing her down. I vividly remember the day my mother was visiting from out-of-town. The children were playing alone in the basement. My younger daughter began crying hysterically. I ran downstairs fearing she was seriously hurt. The first question out of my mouth was directed at my older daughter. “What did you do?” I asked angrily. My child didn’t bother to explain that her little sister had slipped on the library book that was sitting on the bottom step. There really was no point. My beautiful child with eyes that once held so much optimism looked defeated. Silent tears of a broken spirit slid down her face. My daughter knew it didn’t matter what she said, she’d still be wrong; it would still be her fault. And there was my mother standing beside her, a silent witness to the whole ugly scene. "Every time I came down hard on my daughter, I justified my behavior by telling myself I was doing it to help her — help her become more responsible, capable, efficient, and prepare for the real world." “I’m sorry,” I mumbled. My daughter didn’t move. I sat down on the edge of her bed and began saying things I’d never said to another human being — not even myself. “I feel mad inside a lot. I often speak badly about myself in my head. I bully myself. And when I bully myself, it makes me unhappy and then I treat others badly — especially you. It is not right, and I am going to stop. I am not sure how, but I will stop. I am so very sorry,” I vowed trying not to cry. My daughter looked unsure as to what to do with this confession, this unusual offering from her mother who rarely admitted any wrongdoing. I didn’t blame her for the skeptical look she gave me. I understood why she didn’t say anything back, but somewhere in those eyes I saw hope—hope that things could be different. I prayed I could stand up to the inner bully. I knew I needed an easy first step. I decided to use one simple word: STOP. Within the hour, I had a chance to try it. The first critical thought that popped into my head arose as I was preparing to leave the house. I looked at my reflection and thought, “You look fat. You can’t go out looking like that.” “Stop!” I assertively thought to myself, shutting down any further criticisms. Then I swallowed the hurtful words and relaxed my disapproving face. Within mere days of using the “stop” technique, I noticed a change. With a more positive thought process, it was easier to let go of the need to control, dictate and criticize. In response, my daughter began taking more chances and began revealing her true passions. She started movie making and website design on the computer. She made doll furniture and clothing to sell in the neighborhood. She began baking new recipes without any help. Nothing she did was perfect. Nor was it mess-free or mistake-free, but the moment I said something positive, I saw her blossom a little more. That is when I began to clearly see beyond the mistakes and messes to what was truly important. I began noticing my child’s inner beauty rather than looking for perfection on the outside. I began paying more attention to the person she was rather than the successes she achieved. I began letting her be who she was meant to be instead of some idealistic version I had in my head. When I stopped being a bully to my child and myself opportunities for growth and connection opened up. Over time, significant progress was made. In a little less than two years on my journey to let go of perfection and distraction, I received the confirmation I never thought I would receive. It’s hard to love yourself with a bully breathing down your neck. It’s hard to love yourself when the one person who’s supposed love you unconditionally doesn’t. It’s hard to become the person you’re supposed to be when you aren’t allowed to fall down and get back up. If we want our children to become who they’re meant to be, let’s ease up. “Nobody’s perfect” can be two of the most empowering, healing words when said to oneself or to another human being. Let’s stop the ridicule. Let’s stop the relentless pressure. Let’s stop the impossible pursuit of perfection. Only love today, my friends. Only love today. Because love is always a good place to start a new beginning. “Why do you walk like a penguin?” A little boy said this to my daughter, who has cerebral palsy, about two years ago. She didn’t answer him, she ignored his question and talked to the teacher about it. By the time I heard about it, the teacher had already talked to the little boy. But that statement plays like a broken record in my daughter’s mind, you walk like a penguin. nd I wish she never had to hear this, along with the, “What’s wrong with you?” which is especially shocking to hear coming from an adult, but it happens. My stomach flips and flops every time those questions come, but I use it as an opportunity to educate. I have worked up a script where I say, “She has cerebral palsy. It means her muscles are affected.For her, it affects primarily her legs. A few years ago we thought she would never walk, but look at her now! She’s amazing and we are so proud of her!” (and I pause here to say we would be just as proud if she didn’t walk, but this is my little script I rely on when I know I’ll only have a few seconds with those very curious people that feel the need to ask personal questions). I understand kids asking, it’s normal for children to be curious and notice differences. I wish they were more gentle in the asking, but they are kids, they are learning what is acceptable and what is not. I am more than happy to talk to them. But this doesn’t change the fact that my daughter is aware of her disability and she doesn’t like. We have tried to work on some answers for her to give, but when the time comes to use them, she turns around and walks away. But it has been two years since the penguin comment and we’re still talking about it during therapy. Yesterday the therapist said, “I think we need to start working on some scripts for you to use.” We have tried this, but then I realized the responses I’ve given her are my words, not hers. I’ve come up with them, she doesn’t own them. it was my “aha!’ moment. If I want to empower her to become her own advocate, she needs to own her words. She needs to believe them. And maybe for her a simple, “I don’t appreciate you saying that,” will make her feel better than coming up with an explanation of cerebral palsy, or calling them a yellow-bellied-peep-squeak. My youngest daughter has Down syndrome and her speech is hard to understand, I know for her, talking it out is not the best way to go about it. But what can she do? I don’t have all the answers, but I do have a nudging to help my kids stand up for themselves. To help them process their feelings and come up with solutions. I’m learning what it means to empower my kids to become their own advocates. I have a feeling this will be an on-going process as they grow, mature, and understand their own disability better. Some days we do well, some days those questions or comments beat us down. But we do this together, and we’re learning and growing. But I am confident of this, while I am their biggest advocate, I do believe the best advocacy will come directly from them. This is why I want to empower them to become their own advocates. Ellen Stumbo is passionate about sharing the real – sometimes beautiful and sometimes ugly – aspects of faith, parenting, special needs, and adoption. "The greatest gift is not found in a store nor under a tree, but in the hearts of true friends." Cindy Lew This DIY friendship book is the perfect tool to record memories about some of the most amazing people in your life â&#x20AC;&#x201D; your best friends. Make your secret code by drawing a picture for each alphabet. You can use my code, or make up your own. Write your message using the made up codes. Give your secret letter to someone and get them to break the code! reader's survey we'd love to know what you think about kids nation mag. click here to take you to the survey. Be the first to know about new magazine issue and special offers. please click here to subscribe to our free newsletter. thank you for reading and spreading the word about kids nation. we have reached 84 countries across 6 continents.